Pet owners throughout the world know how important it is for them to proactively be a good pet parent to their dogs. This is why pet owners look for a low carb dog food brand so they can be sure their dog gets a healthy diet. If you are a dog owner, you have to make sure your dog eats the right food to help him be free from any disease. It is also a great way you can let your dog be healthy and live up to several years. 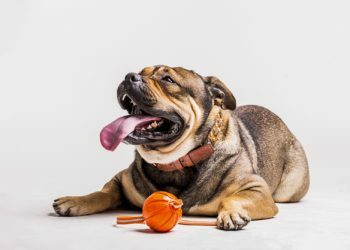 Before going into the best options for a low carb diet for your dog, it is important to know what a low-carb diet is and why it is beneficial for your dog. So what is a low carb diet for dogs and why does it really matter? First things first, do dogs need carbohydrates? According to the National Research Council, dogs do not need any carbohydrates in their diet in order for it to be nutritious. Instead of carbs, dogs need protein and fat to sustain them and their dietary needs. Even though dogs do not need carbs in their diet, these are the dominating ingredient in many commercially available dog food brands throughout the world. If dogs don’t need carbs, why do manufacturers include these in their products? The answer to this is because these ingredients are abundant, durable, and a lot cheaper than protein or fat. Are Carbs Safe for Your Dog? Although dogs don’t need carbs in their nutrition, they are not necessarily bad for them. As a matter of fact, carbohydrates can still be an excellent source of energy for your dog. The problem though is that commercially available dog food products contain excessive amounts of carbohydrates in their formulation. The recommended natural carbohydrate consumption for dogs should just be around 14 percent of his entire diet. 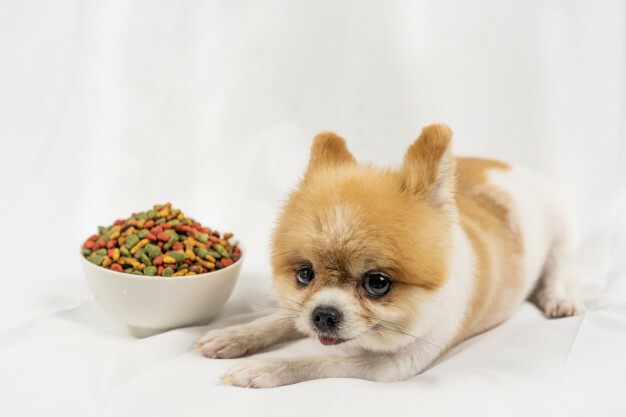 Unfortunately, dry dog kibble brands today contain between 46 and 74 percent of carbs. Because of this, you have to be careful in picking out dog food for your pet. You have to make sure that you opt for a high protein dog food brand instead of one that contains a lot of carbohydrates. This will help you add more years to your dog’s lifespan. The Association of American Feed Control Officers (AAFCO) are responsible for regulating standards for the production of commercial dog food. Based on their regulations, the diet of adult dogs should contain at least 18 percent protein while puppies, pregnant and nursing dogs should have at least 22 percent in their diet. Sport dogs need around 25 percent while sled dogs require around 35 percent. Basically, the idea is that the more active your dog is, the higher is the required protein content in his diet. Depending on your dog’s level of activity, you need to pick out an option that best suits him. 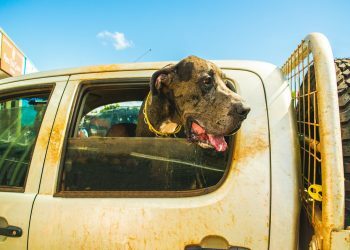 How Does Protein Help Dogs? By nature, dogs are omnivores. But in order to survive and thrive, their bodies heavily rely on protein. This is because protein contains essential amino acids that play a vital role in the production of cells. If your dog does not get enough protein in his diet, he could be exposed to a number of health problems. Apart from losing energy, your dog’s coat will be lifeless and dull. His immune system will also be unable to fight off certain diseases. Who Benefits from a High Protein Diet? Working Dogs – Working dog breeds like German Shepherds and Siberian Huskies need more protein and calories compared to an average dog. 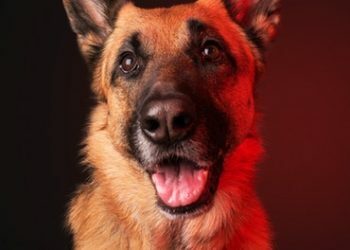 This is because these dog breeds work often in fields such as police or military K9s, guard dogs, search-and-rescue dogs, tracking dogs, hunting dogs, and herding dogs. 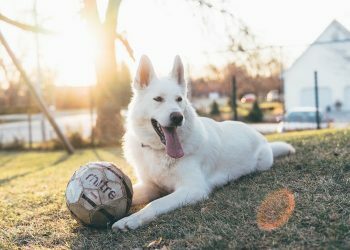 Athletic Dogs – A high protein dog food diet is also beneficial to dogs that spend several hours every week training for disc dog activities, canicross, agility trials, or another canine sport. These dog breeds include Greyhounds, Boxers, Labrador Retrievers, Jack Russell Terriers, and other breeds. By having a high protein diet, they can get enough energy to help them be able to run or jog regularly. Pregnant or Nursing Dogs – Obviously, female dogs that are pregnant and nursing puppies will require more protein than normal dogs. This is because they are feeding their puppies. By having a high protein diet, they can provide the essential nutrients that their puppies require. After knowing that protein is good for dogs, it is important to know that dog food brands get protein content from a number of sources. Usually, you will find that the dog food formulation contains different protein sources. But you have to make sure that he is getting the best for his diet. You should look for dog food brands that get their protein content from a whole meat. Some examples of these include deboned chicken, beef, or salmon. These ingredients are usually listed on the very start of the ingredient list. The next item on the list can be the secondary protein source that acts as a supplemental to the primary protein source. You will need to look for ingredients that heavily rely on animal-based proteins. This means that you should look for chicken meal, liver meal, beef byproducts, or egg protein. Just make sure that when you are looking at the ingredients list, the meat meal or byproduct source has been properly identified. There are also some dog food brands that get their protein from plant-based sources. Safe options include alfalfa or peas, but these usually just pass straight through your dog’s stomach. This is because dogs do not have biochemical adaptations to digest such ingredients as well as animal-based proteins. Even though the ingredient may contain a high protein content, it may be inaccessible for your dog. A good rule to follow is to pick out a dog food brand that relies on animal-based proteins as much as you can. Omega-3 Fatty Acids – Omega-3 fatty acids that come from animal-based products are better than those that come from plants. 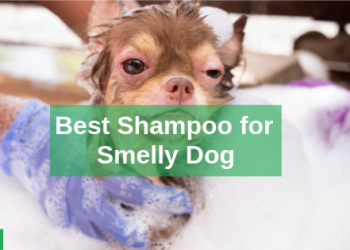 This is essential in helping maintain your dog’s shiny coat and supporting skin health. It also helps reduce joint inflammation. In puppies, this also helps promote proper brain development. Probiotics – Just like you, your dog needs to have a healthy digestive system. One way you can promote proper digestion and elimination is through probiotics. These help make your dog have a healthy gut. As always, you have to remember to pick a dog food brand that does not make use of any artificial flavors, preservatives, or colors. Not only are these things unnecessary for your dog’s diet, they are also potentially dangerous to his health. If you are getting a dog food brand that makes use of high-quality ingredients, you already know that the taste will be good. As for the color, your dog won’t really care about this at all. With so many different dog food brands available in the market, it can be confusing to find which one will be best for your dog. This is particularly true if you do not know what to look for from a commercial dog food formula. But knowing what should be and shouldn’t be in your dog’s food can be a big help. You already know what you should be looking for in your dog’s food. The good news is that there are several brands that contain high protein in their formulation. One downside to picking high protein dog food, however, is that these options typically cost more. This is because low-value protein brands are less cheaper and are more cost effective. Although they cost less, they tend to meet the minimum protein content guidelines that dogs need. 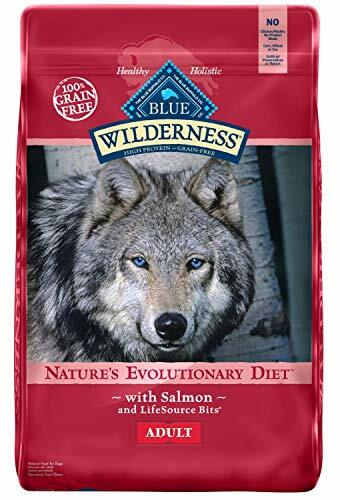 If you are on the search for a high protein dog food brand for your dog, you can trust in Blue Wilderness Foods. This dog food brand aims to create dog food that pleases your dog and follows the diet of his ancestors. In particular, the Blue Wilderness Adult Salmon dog food contains deboned salmon, which is an excellent source of omega-3 fatty acids. Other sources of protein include chicken meal and menhaden fish meal. The formulation is grain-free, corn or wheat. Its carbohydrate content is derived from peas and sweet potatoes. Other ingredients that are included in this formulation are carrots, parsley, blueberries, and cranberries. Apart from vitamins and minerals, the recipe is fortified with five various probiotic bacteria; which all help regulate the digestive system of your dog. 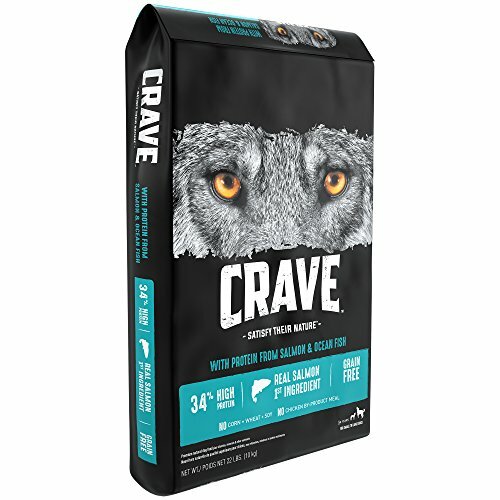 You can also feed your dog Crave Grain-Free High Protein Salmon & Oceanfish dog food since it is nutritious and made from several animal-based protein sources. Its main ingredients include real salmon, chicken meal, lamb meal, and menhaden fish meal. Since the recipe does not use any grains, Crave uses split peas, chickpeas, and dried potatoes as sources for carbohydrates. The formulation also contains sunflower oil as a healthy fat that promotes a healthy, shiny coat for your dog. 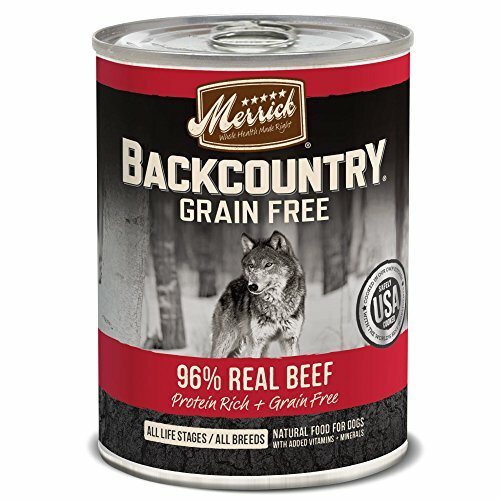 If you are looking for a canned dog food meal for your dog, Merrick Backcountry Grain Free 96% Real Beef makes for a good choice. Its main ingredients include deboned beef, beef liver, beef broth, dried yeast culture, and dried egg product. The formulation contains 78 percent moisture, 10 percent protein, 3.5 percent fat, and 3 percent fiber. 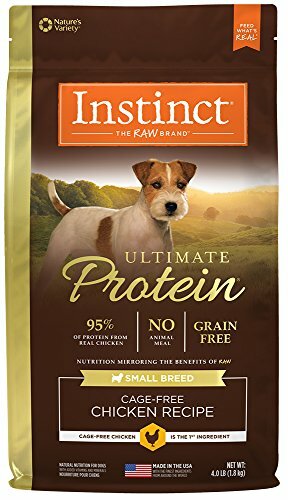 Another dry dog food brand that contains high protein ingredients is Nature’s Variety Instinct Ultimate Protein. This brand contains 95 percent protein coming from duck or chicken. The formulation contains 47 percent protein, 17 percent fat, and 3 percent fiber. Other brands use animal meal or plant-based proteins. In addition to this, the formulation does not contain any corn, grain, soy, wheat, or by-product meal. This makes it a great choice for anyone who is looking for a potato-free, low-carb, and grain-free dog food product. The top ingredients included in this dog food brand include chicken or duck, tapioca, eggs, chicken fat, natural flavor, and ground flaxseed. 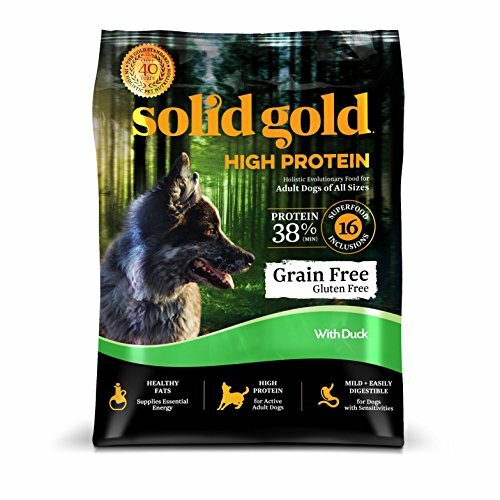 You can also check out Solid Gold High Protein with Duck since it is a holistic dog food. It makes use of different high-quality protein sources, such as duck, turkey meal, and chicken meal. Other sources of protein included in this dog food are whitefish meal and egg protein. As for its carbohydrate content, Solid Gold uses peas and chickpeas. The formulation also includes pumpkin, carrots, apples, broccoli, blueberries, and many others. As a whole, the recipe is able to provide your dog the vitamins and minerals he needs. Among the different dog food brands in the market, The Honest Kitchen is one that brands itself as a maker of “human grade low carb dog food.” This is because the brand is built around the idea of providing the same quality food to your dog as to humans. They manufacture their products at human food facilities and only source fresh organic produce. 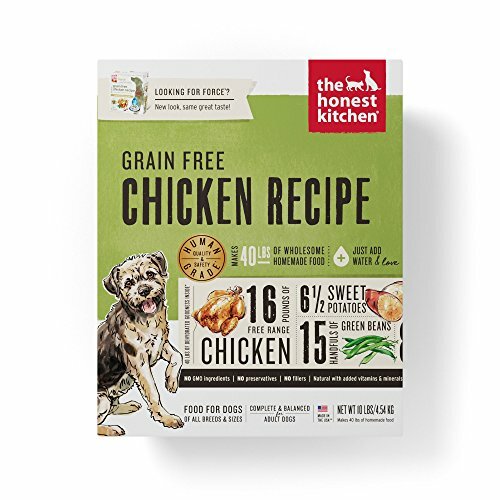 The major ingredients of The Honest Kitchen Force Grain-Free Dehydrated Dog Food include chicken, potatoes, sweet potatoes, celery and organic flaxseed. Another dog food brand that contains high protein is Orijen Tundra Dog Food’s Tundra Biologically Appropriate Grain-Free with Duck, Mutton, Goat, Venison and Boar Dry Dog Food option. 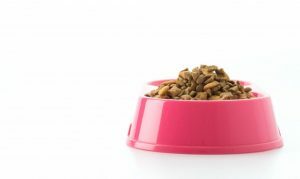 This particular dog food has 38 percent protein content and 16 percent low-glycemic carbohydrate content. The mix makes for a great option for those looking for a low-fat, high protein, and low carb dog food diet. Among its ingredients include fresh goat, fresh venison, fresh wild boar, and fresh duck. 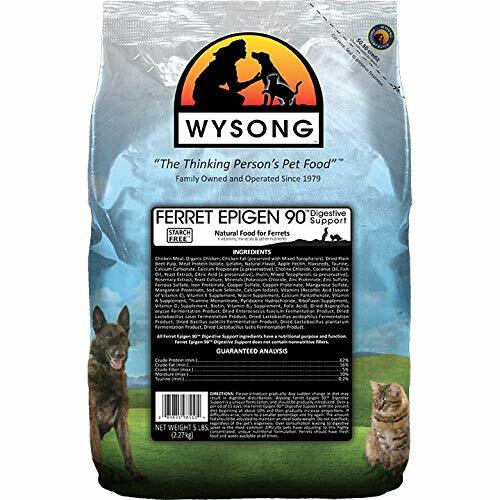 One of the brands that are equipped with high protein ingredients is Wysong Epigen 90. The formulation comes with 63 percent meat-based protein. It also contains 3 percent fiber and 16 percent fat. According to their label, they only use starch-free food. Among the top ingredients that can be found in this dog food brand include organic chicken, turkey meal, chicken meal, meal protein isolate, and potato protein. As a dog owner, you have to remember to pick out dog food that is good for your dog’s health. 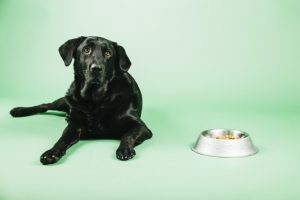 High protein dog food brands may shock you at first since these are typically more expensive than other commercial dog food brands. There’s no way to work around on this since these dog food brands really make sure to use the right ingredients that are good for your dog. But if you want to provide for your dog, you have to make the right choice.